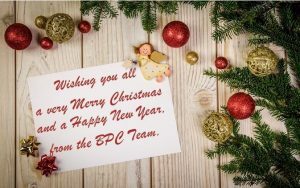 At BPC, we like to ensure our customers make the most of the Christmas and New Year festivities, without having to worry about when their order is going to be delivered. So, for any of our customers requiring delivery before Christmas, please ensure your orders are placed no later than 11am on Wednesday 20th December. Our offices will be closed from 5pm on Thursday 21st December and re-open at 8am on Tuesday 2nd December. We would like to take this opportunity to thank all of our customers, stockists and partners for your support this year. We wish you a happy and prosperous New Year!